After the theatrical display in the last County Commissioners meeting, with Chairman Burgin moving to dismiss lawsuit against fellow Commissioner House, the Lawsuit moves forward. The move by Burgin to drop the lawsuit did not stand water and the attorney representing the county in the Rogers-House case is moving forward with dispositions scheduled for the end of February. 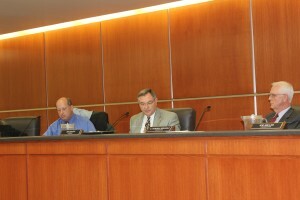 The move by Chairman Burgin was not enough authority to stop the suit without the vote of the board. This is great news but what will Burgin do next in a attempt to stop the action. He is so worried about this lawsuit is something that implicates him that is causing him to worry? Hopefully they will roll on each other and the real truth will come out. Thank you for reporting this as we will not get this news in the other Pro Burgin distorted paper. Okay, so a nut job with a tape recorder lures Gary House into believing that there’s a huge conspiracy to defraud the county. The state attorney general finds no criminal issues. House got duped, the county discovers employees got free lap dances at Myrtle Beach courtesy of a contractor and that should be the end of the story. But partisan politics has convinced some that spending a quarter million dollars is good so the ‘truth’ can out. Now who is duped? The taxpayers and residents.